Whatever your choice of accommodation, you will enjoy a breathtaking view of Sogod Bay​!  Our rates are very reasonable, and if you dive with us, you will get the diver’s rate on PRIVATE COTTAGES. Special rates apply for groups from 7 to 40 divers. Split-level with terrace on water’s edge. It has mini- kitchen, dining table, 42 & 32 inches TVs’, refrigerator, gas burner, king size bed and four single beds. It can hold up to six people. Each room has air conditioner, fan and private bathroom with hot & cold shower. Free coffee, tea and mineral water are provided. You have the options to take just the master bedroom or the bigger part of the house only. We give lesser charge if you are renting the full house. It has a fantastic view over the pool and to the ocean. It has queen size bed, mini- kitchen, refrigerator, 40 inches TV, air-conditioner, fan and hot & cold shower. Free coffee, tea and mineral water are provided. Note: It is possible to add another single bed at a cost of PHP 250 if required. Newly renovated cottage. It has two single beds, big bathroom w/ hot & cold shower, air conditioner, mini fridge, 40 inches TV and a large terrace with a mini sofa facing the ocean. It was built close to the shore where you can enjoy the view of Sogod Bay. Free coffee and tea are provided. Situated in a quiet spot near the pool. It is standing two meters away from the ocean and ideal for couples. It has 1 Double bed, air-conditioner, fan, 32 inches wall mounted TV with cable connection and hot & cold shower. It has one king size bed and one single bed, 32 inches TV, mini-fridge, large bathroom w/ hot & cold shower and a huge terrace over the shore where you can enjoy the great view of the ocean. It is located next to the restaurant. It has two single beds, air-conditioner, fan, 32 inches TV with cable connection, bathroom w/ hot & cold shower and a terrace facing in the ocean. Located near the car park. It has three single beds, air-conditioner, fan and bathroom with hot & cold shower. facing the ocean with excellent view. Air-conditioned rooms plus fan with shared bathroom. Each room has one bunk bed good for two persons.